Esri president Jack Dangermond welcomes will.i.am to the Esri International User Conference. It’s not every day that a musician inspires a mapmaker. But that’s exactly what happened at the 2013 Esri International User Conference (Esri UC) in San Diego, California. 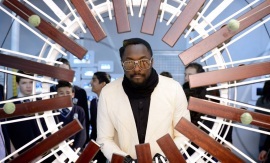 It’s where will.i.am, the hip hop/pop recording artist and founder of the Black Eyed Peas, gave Katherine O’Brien, the GIS coordinator for facilities at the University of North Carolina (UNC), Chapel Hill, the nudge to commit to mentoring students in how to use geospatial technology. “I need to go back and work with kids,” said O’Brien, whose interest in helping young people learn GIS was kindled by a talk given by will.i.am at the Esri UC. 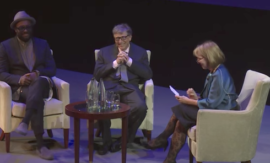 He started the philanthropic i.am.angel Foundation in part to support science, technology, engineering, and mathematics (STEM) education in the classroom. 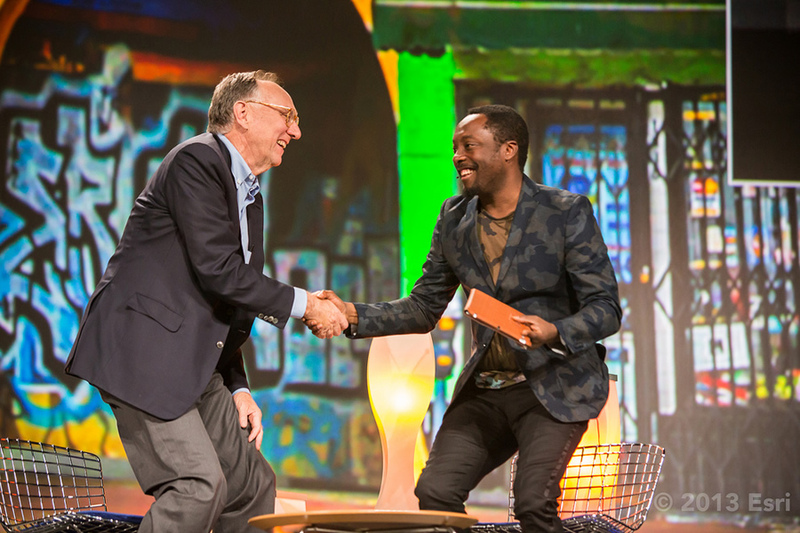 Esri president Jack Dangermond spoke one-on-one with will.i.am, born William James Adams, at the Esri UC Plenary Session about his passion for helping young people get a strong STEM education, including learning to use GIS. 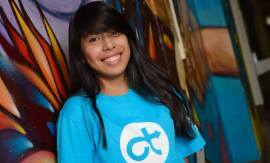 Their 30-minute conversation followed a demonstration of mapping projects by four 11th-graders from Roosevelt High School in the Boyle Heights neighborhood of Los Angeles, California. 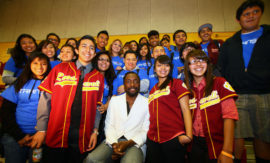 Though he did not attend school in Boyle Heights, will.i.am grew up there and now supports the community and the students through the i.am.angel Foundation. He helped arrange for the students to use ArcGIS for their school projects after meeting Dangermond at a conference in 2012 and seeing the technology in action. The i.am.angel Foundation chief of staff Enrique Legaspi said GIS is an innovative tool for people to better understand the challenges in their neighborhoods. “GIS maps are part of a new feature of education—getting students to think critically, collaborate meaningfully, and ask the right questions to design real solutions using GIS technology,” he said after the students finished their presentation. (Watch the video). Roosevelt High School Students (from left) Alexander Cosio, Stephany Ortiz, Uriel Gonzalez, and Roxana Ayala show the types of analysis they did using Esri ArcGIS. Roosevelt High School Students (from left) Alexander Cosio, Stephany Ortiz, Uriel Gonzalez, and Roxana Ayala show the types of analysis they did using Esri ArcGIS. 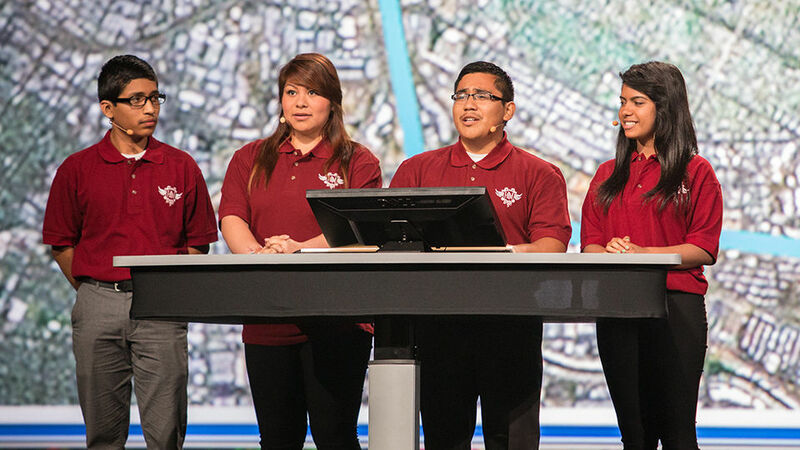 Roosevelt High School Students (from left) Alexander Cosio, Stephany Ortiz, Uriel Gonzalez, and Roxana Ayala show the types of analysis they did using Esri ArcGIS.